The National Institute for Health and Care Excellence (NICE; 2015) have outlined several interventions for supporting young people with attachment difficulties which, despite being frequently used currently have limited good quality evidence. NICE (2015) have recommended that both randomized control trials and qualitative research is conducted into parent and children’s experience of interventions including DDP. 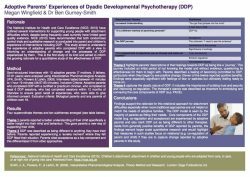 This study aimed to understand the experience of adoptive parents who completed DDP with a view to informing an understanding of change and the processes of DDP experienced by them. This is the first study of its kind and aimed to inform the growing rationale for a quantitative study of the effectiveness of DDP.